In the 59th match of IPL 2014 held today, Chennai Super Kings faced kings XI Punjab. Kings XI Punjab won the match by 24 runs and marked their place in finals. Kings XI Punjab is going to meet Kolkata Knight Riders in the finals scheduled on 1st June in Bangalore. Kings XI Punjab played a wonderful match. Really the match was a perfect entertainer. Viru played a complete match to score a century. 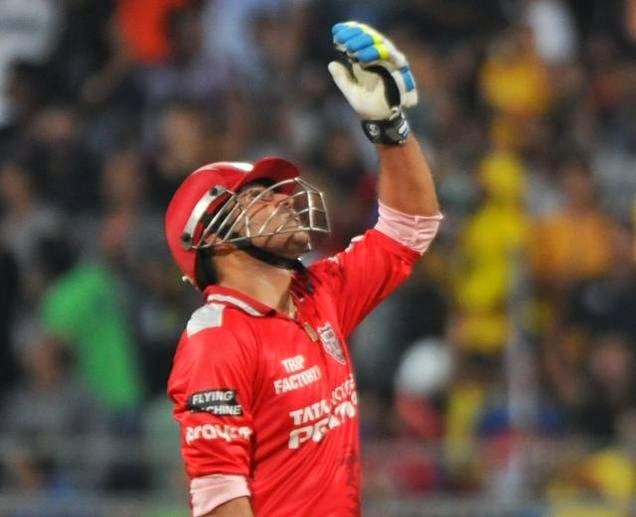 Virendar Sehwag and Manan Vohra given a excellent start to Kings XI Punjab with a First wicket partenrship of 110 runs. The next player to enter is the most expected player Glenn Maxwell. But Maxwell gone for 13 and David Miller entered the crease and made a decent play. Viru departed for 122 in just 58 balls. Finally at the end of 20 overs, Kings XI Punjab made a grant total of 226/6. In Chennai Super Kings bowling line, Ashish Nehra took 2 wicket whereas Mohit Sharma, Ishawar Pandey and Ravichandran Ashwin took 1 wicket each. Chennai Super Kings entered the crease with the huge target of 227. Dwayne Smith and Faf du Plessis are the players to start CSK innings. Both failed to give a good start to Chennai Super Kings. Suresh Raina is the next player to enter the crease and made an outstanding knock. Raina scored fastest score of 87 in just 25 balls. Raina was expected to score the fastest hundred in IPL which was held with Gayle in 30 balls. Unfortunately Raina departed for 87 in 25 balls. Next to Raina , rest CSK players failed to perform well. CSK were 100/2 in 6 overs. The match totally changed in the hands of Kings XI punjab after Raina departed. Finally Chennai Super Kings scored 202/7 in 20 overs and lost their chance of entering the final. In Kings XI Punjab bowling line, Parvinder Awana took 2 wickets whereas Mitchell Johnson, Sandeep Sharma and Akshar Patel took 1 wicket each.